Exactly what is the 484 Preservation Group? We are a group of enthusiasts in Scotland who acquired and restored a 1954 Leyland Titan double decker bus. It was initially acquired by a member of the group in October 2005 and the group itself was officially registered as the owner in October 2006. The vehicle we restored is registered GM 6384 and carried the Central SMT fleet number L484 (hence the name of our group). Out of 631 Leyland Titan half-cab double deck buses operated by Central SMT, L484 is the only remaining example. The first started service in 1929 and the last one was withdrawn in early 1976, a span of over 46 years. There were ten basic models from TD1 to TD7 and PD1 to PD3. Of the early range, Central only operated TD1, TD4, TD5 and TD7 models and later had different variations of the PD1, PD2 and PD3. Fleet numbers L1 to L496 had exposed radiators and L497 onwards had the 'tin fronted' version. 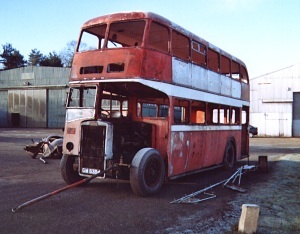 Eight different companies supplied the bodywork, the main three being Leyland, Northern Counties and Alexander. Over half the fleet (328 in number) had Leyland bodies all with exposed radiators, which makes L484 typical of the fleet. It is in fact a PD2/10 model with Leyland body, exposed radiator, vacuum brakes and synchromeshed gearbox. First registered on 30th September 1954, it entered service on Monday 4th October 1954. Leaving the Bothwell Road depot at 4.00am, it ran private (no passengers) to Cambuslang and then did a short working to Newton. From there it started the full service to Carlton Place, Glasgow on the 75/76 routes. The 75 travelled through Westburn to Cambuslang then on though Burnside, Rutherglen and Shawfield to Clyde Place, Glasgow where all passengers had to disembark. It then crossed the River Clyde and laid over in Carlton Place for a short break before returning on service 76. From Newton, the 76 travelled through Hallside and Halfway to Cambuslang then followed the same route to Glasgow reverting to 75 on the return journey. The reverse process was repeated at Newton. Each route provided a 20 minute service, leaving at alternate 10 minute intervals. After a full day it returned to the depot at midnight. An oil and water check by the nightshift staff and it was off again at 4.00am. This pattern continued every day, seven days a week for over three years when it was withdrawn for a minor overhaul and subsequently removed from the Newton run. Although it did return occasionally, it also ran on other routes from different areas of Lanarkshire to Glasgow including 52/53 Coalburn; 54 Strathaven; 55 Netherburn and 56 Shotts. From March 1967 it was transferred to Nerston at East Kilbride and was used on various routes before being withdrawn and sold on 29th May 1969 to George Wilson of Stonehouse, a local builder. There it was used as a crew bus for 11 years taking workers to building sites in East Kilbride and Cumbernauld, finally ceasing work on 10th December 1980, its working life having operated for an amazing 26 years. For the next 25 years it was owned by several private individuals and stored at the Scottish Vintage Bus Museum in Whitburn, West Lothian, subsequently moving to the museum's current premises at Lathalmond, Fife in 1992. Although it was only associated with two Central SMT depots, it is nevertheless representative of the fleet from all the other depots, i.e. Traction House, Motherwell; Burnbank Road, Hamilton; Stewarton Street, Wishaw; Gavinburn, Old Kilpatrick and sub depots at Carluke and Muirkirk. It therefore represents the history and heritage of bus travel throughout west central Scotland from the 1930's to the early 1950's.